The “Freedom” hive is a new development by Bee Kind Hives for 2016. 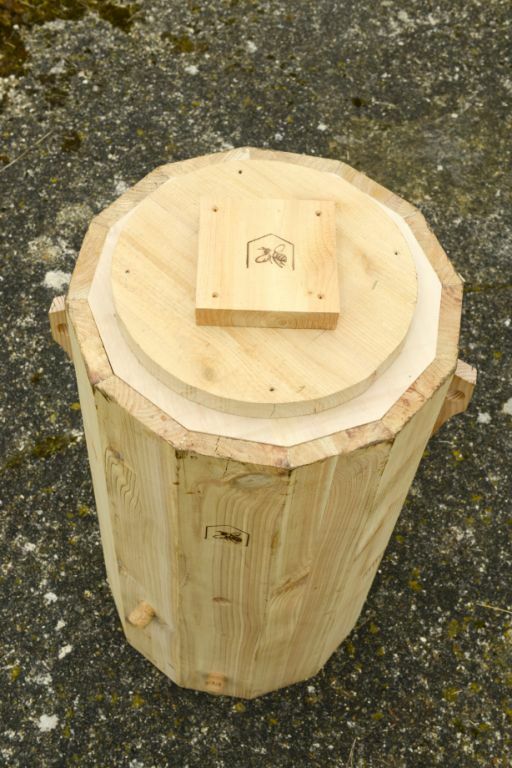 It has the advantages of using log hives but weighing only 17kgs, can be hoisted easily into trees or put on a tripod stand. 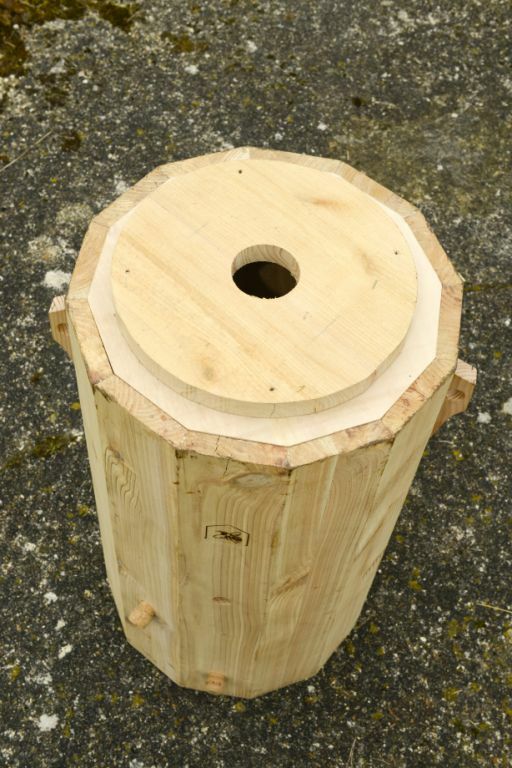 The hive body is a 12 sided cylinder with a volume of 55 litres. I make the hives from Western red Cedar which is a light durable timber with good insulation properties. The sides of the hives are a combination of wood/compressed shavings/wood to give thick warm walls. Below is a selection of images describing the hives. More pictures will be added in posts as the year develops as hives are put up in trees and hopefully populated by bees. Looking down into the hive, showing the three layers. The body with top ring and top board. 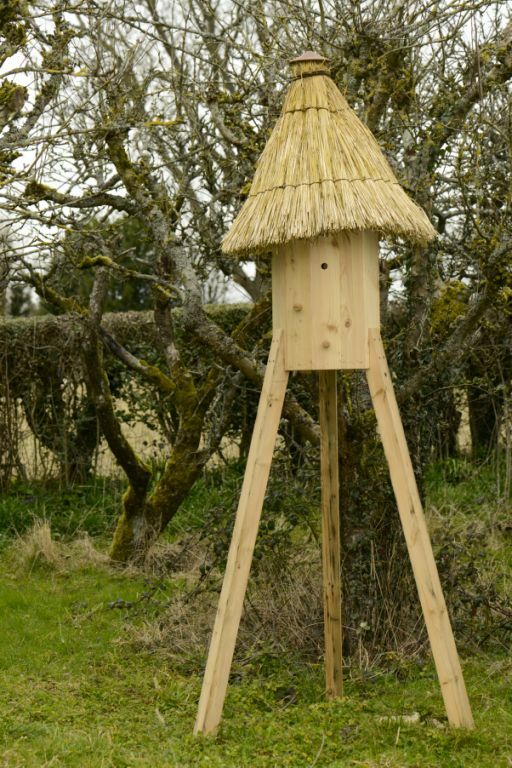 The top board has a “depriving ” hole which allows for a super, or small skep to be added.If it is a good year, a honey crop might be possible. The hole is covered initially when setting up a new colony. 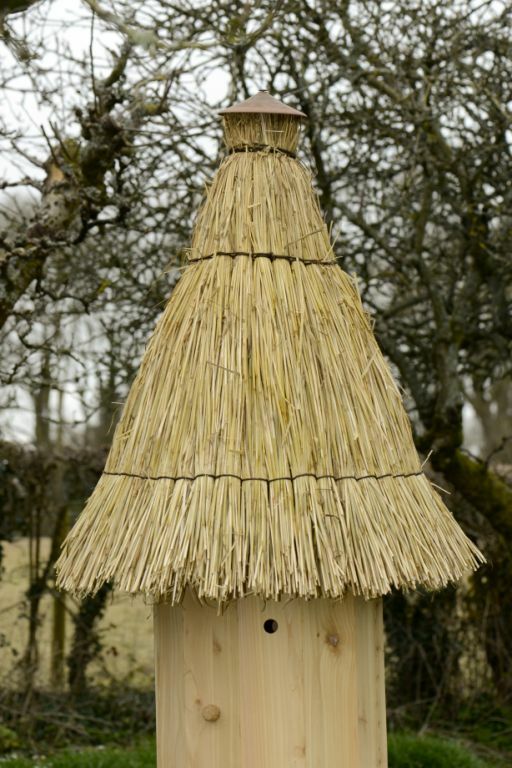 A freedom hive on a stand with a conical straw hat or”hackle”. Close up of hackle with ceramic hackle cap. Can one put them up anywhere ? Yes in theory. Bees like us, prefer a position that is sheltered and facing South East to get the morning sun (northern hemisphere). They can be put on stands but I am busy putting them up about 3m in Oak trees. More posts will follow on how this done. Please let me know the cost of a “Freedom” bee hive. Do you ship your Freedom Hive to the USA? Hello Dolly, Not at present but if you were able to work out the shipping ,I would be happy to. I would be interested in purchasing the plans for your Freedom Hive and to begin making them available in the USA. I have spoken to Heidi Hermann and she thinks that if it is alright with you it would be a wonderful thing to get them in use in the US. I also sent you an email on 09/09/2016 with regards to this. Are these allowed in the US? My understanding is that the frames or combs must be removable for inspection for disease/pest control in order to be considered “legal” hives. Living in England I have to say I don’t know the laws in the US but then I would suggest that the bees don’t know either. What we are trying to do is give the bees a habitat where they can survive through natural selection away from the manipulations of Humans. So in a sense you are not a “beekeeper” if you put up a log hive and bees make the decision to move in by themselves.. They are wild creatures and should be treated the same as if we put up an owl box. There are many people who are doing this already in your country or have them occupy their buildings. 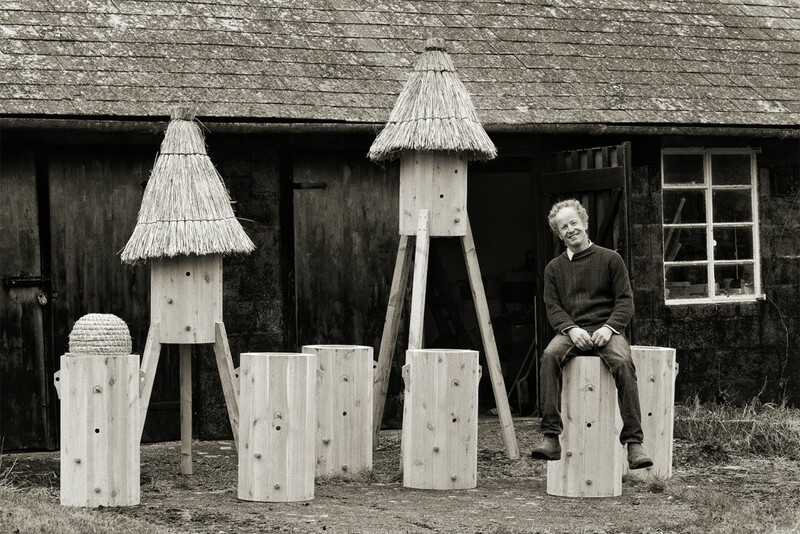 Have you come across Micheal Thiele, Gaia bees? Do you have to put sticks across the top to give the bees something to draw comb on? I don’t put any sticks or top bars for the bees to draw comb as I assume that the bees wouldn’t have it in a wild hollow tree and so let them decide how they want to arrange their comb. When I set up the hive I do place some old brood comb in the top board which is in line with the entrance holes. However I have noticed that the bees pull this down and grow fresh comb attaching it to the top board. I have also put some spales about 8″ down for them to grow comb round which might help in supporting it. This again probably isn’t necessary as it wouldn’t be in a natural hollow. Hello, How is the floor of the hive constructed? Do you have a removeable “varroa” drawer? Do you have a mesh installed? Kind regards. Erik. The floor of the hive is solid wood, which can be dropped to clean if necessary. I do not treat any of the hives for Varroa, and I don’t have significant winter losses or cases of DWV. When I look at the floor occasionally I don’t see significant numbers to worry about.. The bees originate from wild swarms which may have already adapted to living in balance with varroa. I also don’t keep multiple hives in one area which also helps reduce the spread of diseases. I know this will sound incredibly naive but I know nothing about keeping bees, yet I have a huge desire to have a Freedom Hive in my large rural South Yorkshire garden just for the sake of giving bees a home, helping them survive and live how they want to live. I’m not interested in imposing my will on them or taking any honey from them. I am very interested in minimal intervention! Would a Freedom hive work for me? What would be required of me to keep one? I think the construction of this hive is the most beautiful I’ve ever seen! What are the rough dimensions? It looks like it’s 4′ tall and about 12 across. It also looks like the outside wall is 1″ thick and the inner wall is much thinner. I’m in the US and I make all my own equipment and lots of habitats for preserves in my local area. I’d like to wing it and put a few of these up in the preserve down the road from me. Hi Mark, The rough dimensions are length 32″ width 18″. The outer wall is 1″ and the inner wall 3/8″. I am sure you can work out how to make them from the photos. I’m going to try and build one of your Freedomhives. The design seems quite clear to, except for the entrace holes. I was wondering if you use some kind of tube or the likes, because if I would just drill through the walls, the bees will enter the space between the two walls. Thank for sharing your knowledge and enthousiasm. I hope to be able to do the same in The netherlands. Thanks for getting in touch. The solution is quite simple. The gap between the outer wall and the inner timber is about 40 mm. So I make some timber the same thickness and put this on the inside before I place the inner wood sleeve and fill with shavings. 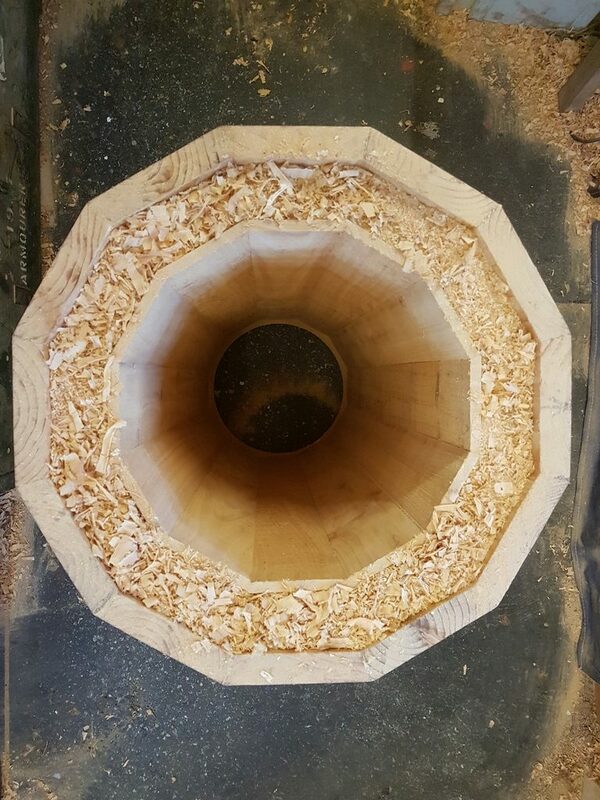 Then when all done I can drill holes through “solid timber”. Beautiful design and respectful approach to Bee Stewardship. Thank You for sharing. I do hope we can make some to use here, in the USA. Do you harvest Honey with these? No, these are conservation hives. They are for the bees to produce healthy workers drones and a community of bees adapted to the local environment. In the UK I have had success in bees populating these by themselves and thriving with out interference from man. I catch swarms from these to use in golden hives… Post will be written shortly about this in more detail. Wonderful blog you have here but I was wondering if you knew of any discussion boards that cover the same topics discussed here? I’d really like to be a part of online community where I can get feedback from other knowledgeable people that share the same interest. If you have any suggestions, please let me know. Kudos! Thank you for sharing excellent informations. Your web-site is very cool. I am impressed by the details that you’ve on this site. It reveals how nicely you understand this subject. Bookmarked this website page, will come back for more articles. You, my pal, ROCK! I found just the info I already searched all over the place and simply couldn’t come across. What a perfect site. Good day! I simply want to give an enormous thumbs up for the great information you have got here on this post. I might be coming back to your weblog for more soon. fantastic put up, very informative. I’m wondering why the opposite experts of this sector don’t notice this. You must proceed your writing. I’m sure, you’ve a great readers’ base already! This is very attention-grabbing, You’re an excessively skilled blogger. I have joined your feed and sit up for looking for more of your excellent post. Also, I’ve shared your website in my social networks! I do like the way you have presented this specific situation plus it does present us a lot of fodder for consideration. On the other hand, from everything that I have experienced, I just simply hope as other feed-back pack on that people continue to be on issue and not start upon a tirade involving some other news du jour. Still, thank you for this superb piece and though I can not necessarily concur with this in totality, I value your standpoint. Hey there! I’ve been reading your website for a while now and finally got the bravery to go ahead and give you a shout out from Austin Texas! Just wanted to say keep up the fantastic work! You made a few good points there. I did a search on the matter and found a good number of persons will agree with your blog. You actually make it appear so easy with your presentation however I to find this topic to be really one thing that I believe I would never understand. It sort of feels too complex and extremely wide for me. I am looking ahead on your next put up, I’ll attempt to get the hold of it! Thank you for some other fantastic article. Where else could anyone get that type of info in such a perfect manner of writing? I’ve a presentation next week, and I am on the look for such info. Great site. A lot of useful information here. I am sending it to several pals ans additionally sharing in delicious. And certainly, thanks on your effort! Thank you so much for providing individuals with a very special opportunity to check tips from here. It’s always so pleasing and jam-packed with a good time for me personally and my office colleagues to visit your blog on the least three times in a week to study the latest stuff you have. And definitely, I’m so certainly amazed with your spectacular pointers you serve. Some 3 areas on this page are clearly the very best I’ve ever had.